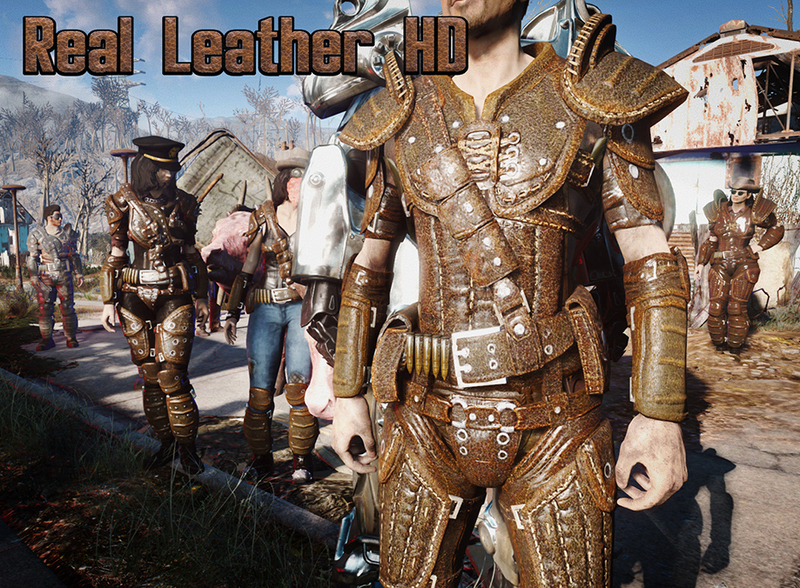 4k and 2k retextures of all leather gear using photos of real leather. Aiming for realism and a unified aesthetic, while sticking reasonably close to the vanilla color scheme. Shiny and matte finishes available. FOMODs for NMM and MO available, thanks to neotropic! 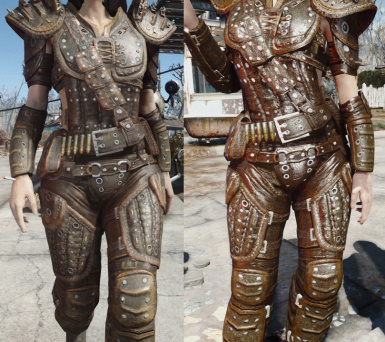 4k and 2k retextures of all leather gear using photos of real leather. Aiming for realism and a unified aesthetic, while sticking reasonably close to the vanilla color scheme. 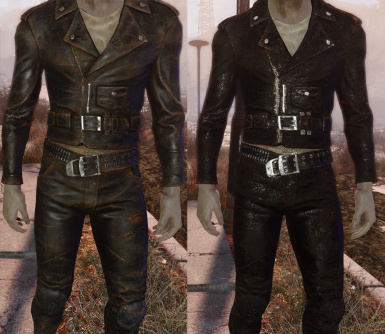 Yes, they are shinier than vanilla by default - only raw, untreated leather is as flat as the vanilla texture. 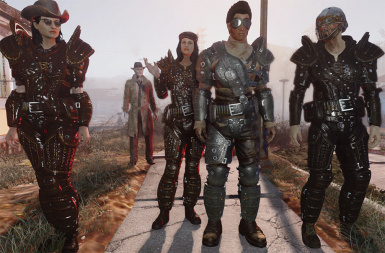 This is a fundamental part of this mod, not a bug. 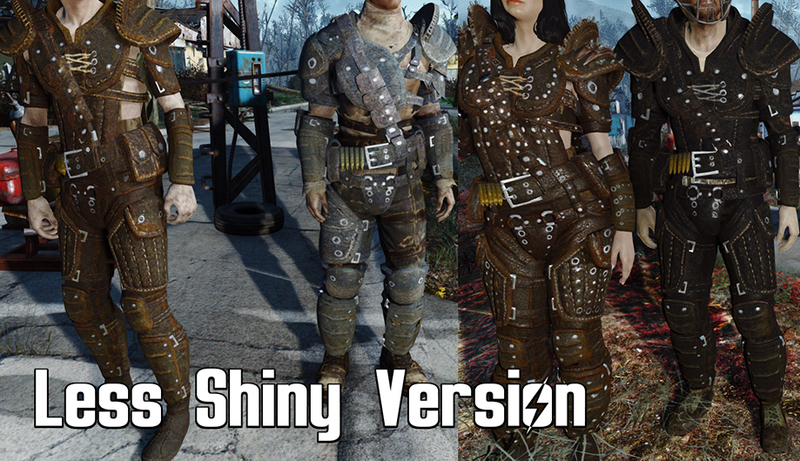 However there are alternate spec maps for those who want a less shiny version available in the optional files. All finishes and makes of leather armor are covered, as well as longjohns, raider leather, the harness, and the road leathers. 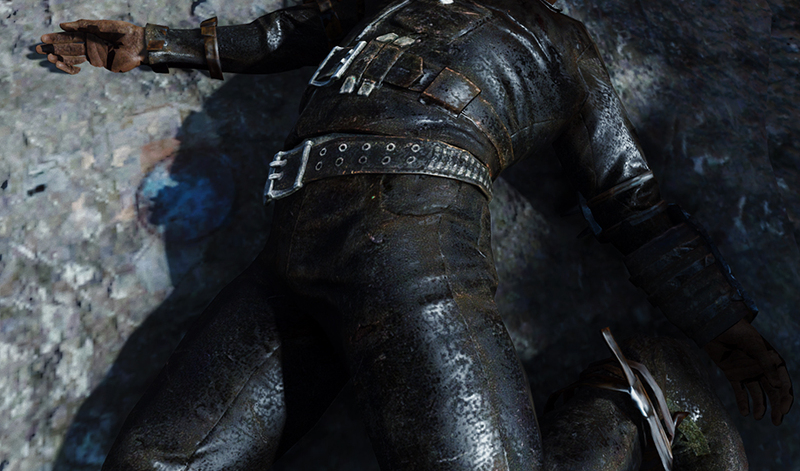 I've redone every single specular map to simulate the high gloss/low specular nature of real leather as well, and polished the metal bits somewhat. 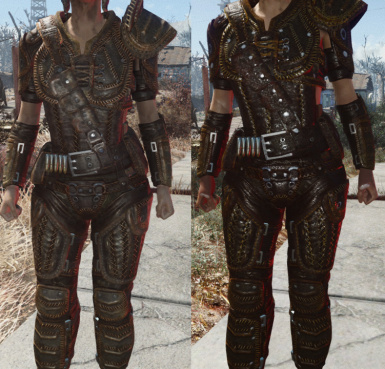 There are also black variants of the armor pieces and the harness. 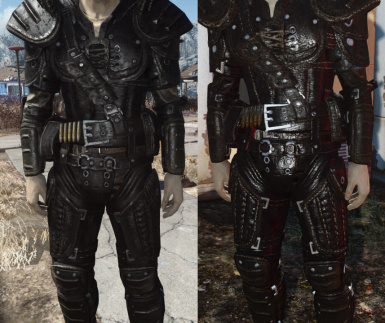 There are some nice leather mods on the Nexus but none of them seemed to fit together well. 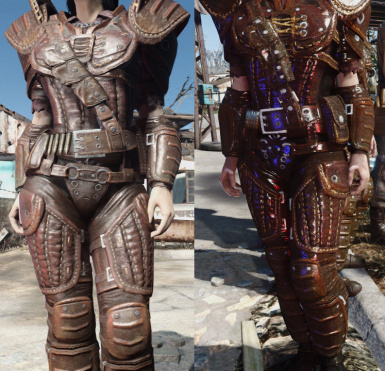 That was the idea behind this one, to make all of the leather in the game mix and match without looking weird. Every effort has been made to hew close to the vanilla styles, while making each variety stand out on it's own. 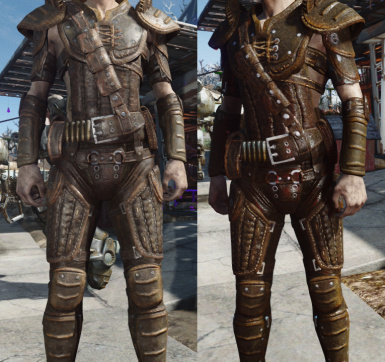 Thus the "braced" mod (above) emphasizes the stitching, the boiled armor has a new specular map to accent its mottled hide, etc. 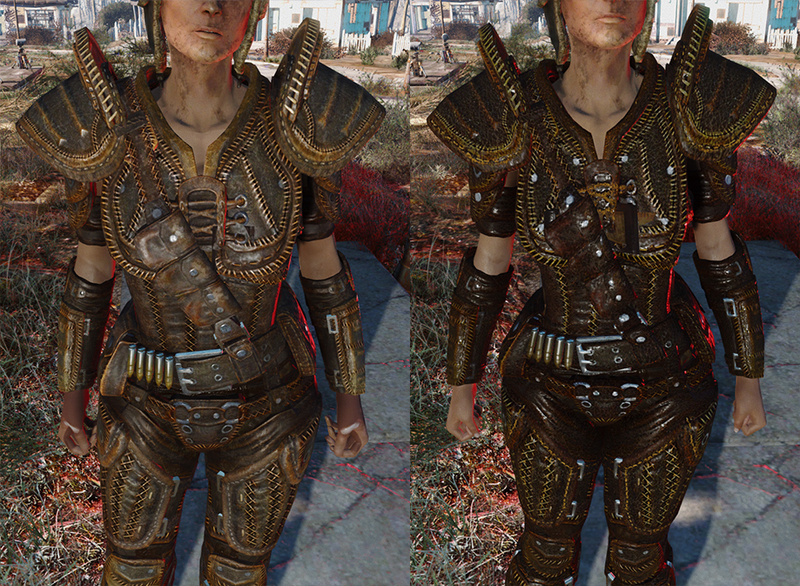 Studded armor has been tweaked to make the metal bits really pop out and shine. The "treated" mod is inspired by Japanese lacquered armor, and given a high gloss and iridescent finish (below. Think samurai armor. 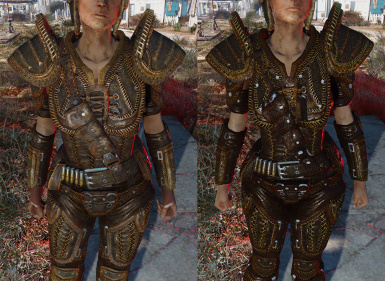 There's also an optional file to make the shadowed armor more matte finish, for maximum sneakiness. 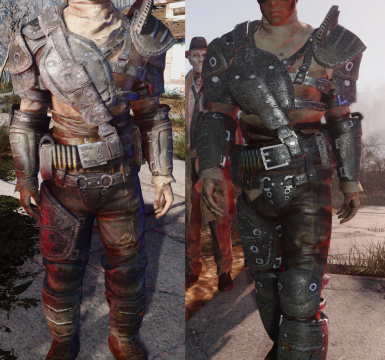 The harness has been given a leather overhaul to match the browns of the default armor, and the road leathers and raider leathers are battered and worn, and tuned to match the shadowed armor. 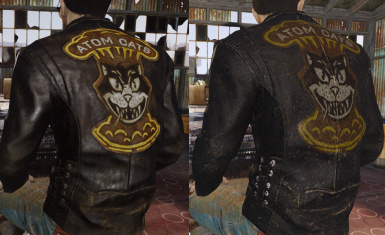 There's also now a greaser jacket and Atom Cats jacket to match (above). Pick whichever variants you would like to use, 2k or 4k. If you want the less shiny spec maps, install those afterwards. They work with all sizes. If you switch sizes, reinstall them after you are done. 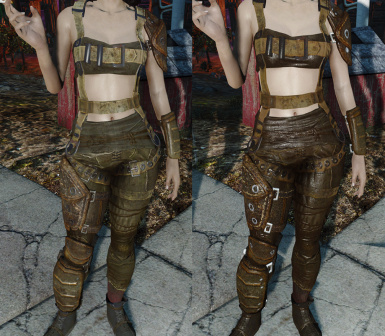 Fully compatible with CBBE, Bodyslide, and any other mesh mods. 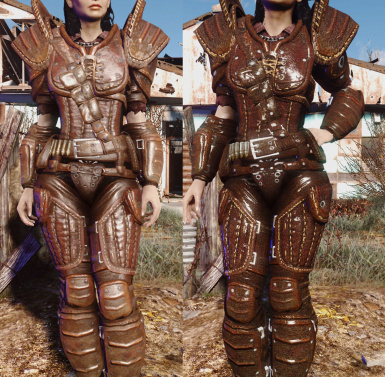 I strongly recommend you get my Leather Armor Bugfix - Vanilla and CBBE to fix the right arm bug. 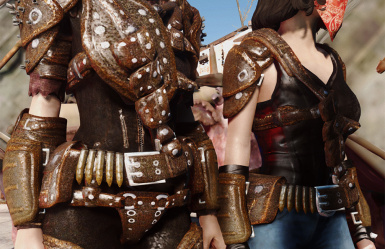 Also check out Denim and Leather for Cait to make the corset match this set.